It uses the same image sensor as the NEX-5 and NEX-3, and can record 14MP still images as well as 1920x1080/60i video. It uses optical image stabilization in a new 18-200mm E-Mount lens. I was very impressed by this unit when we first got to see a glimpse of it a few weeks ago. We can't wait to get our hands on these new NEX models. So will the 18-200mm lens work on the Nex cameras, when you look at the nex lenses, it does not show up. But is it an Alpha? for the a-mounts lens to a e-mount body. Just can not find it any where that says that the 18-200mm e-mount will work with the nex 3 or 5. But most the a-mount on one of those small bodies would make it kinda of awkward to handle the camera i think. 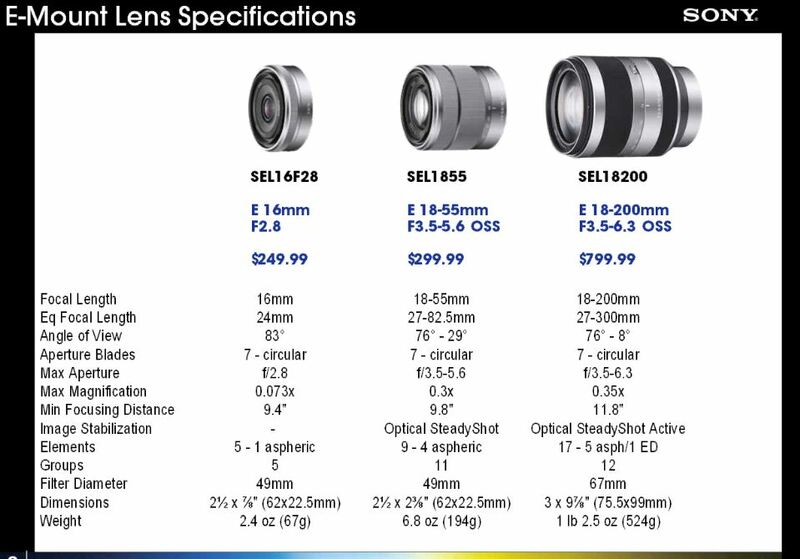 So it the e mount 18-200 will work on the nex camera, that gives them 3 lenses that will work, but since they do not sell the 18-200 by itself, and it is not listed as nex lenses. I don't know if it will work, or is the lens work getting the camcorder to use it with the camera. Last edited by shoturtle; Jul 14, 2010 at 3:53 PM.